I love love LOVE custard based ice creams. So creamy and so delicious, BUT sometimes you want ice cream FAST (or maybe your wary of trying the eggs in the custard). 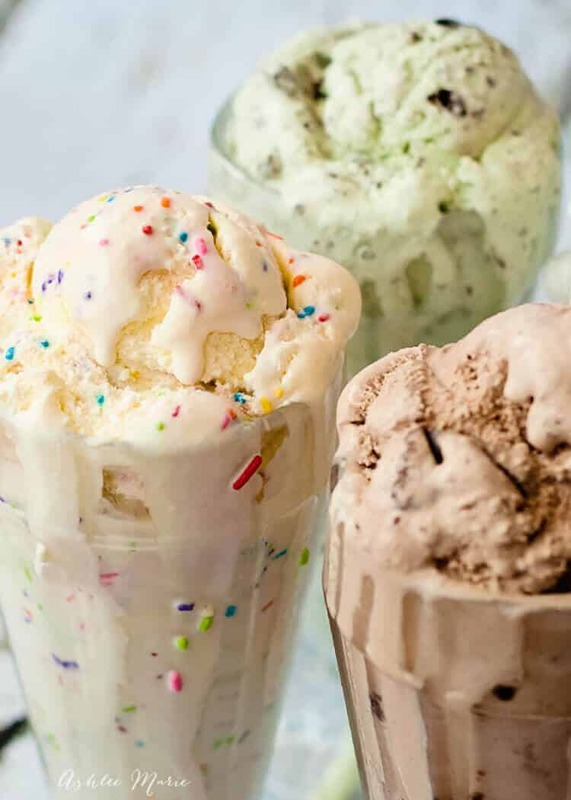 This is the ice cream recipe I first started out with. It’s QUICK easy and can be changed into ANY flavor! The base is just milk, cream and sugar. Easy peasy! 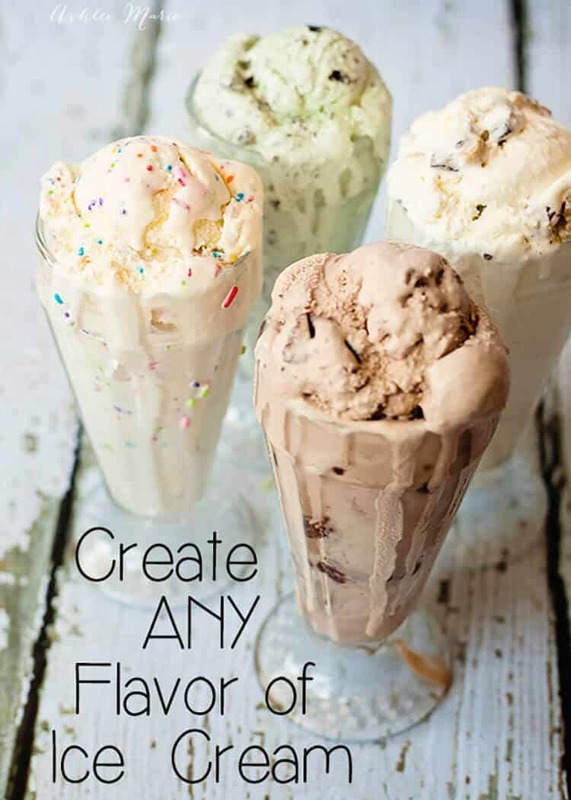 Then add flavoring or extracts (vanilla, mint, almond, etc…) AND for more flavor options add something else, like peanut butter, hot fudge, cake mix, caramel, etc… anywhere from 1/2- 3/4 C of anything. Start with a little and add more, since there is no eggs you can taste it as you mix and decide when it’s enough. Then pop it in the ice cream machine“>ice cream machine! After the ice cream is done the fun really begins! You can all all sorts of mix-in’s or ribbons of sauces! I like sprinkles, chocolate chunks, crushed cookies, cookie dough balls, english toffee, chopped nuts and homemade marshmallows. Or little ribbons of hot fudge, caramel or marshmallow frosting. Stir the milk, cream, sugar and vanilla/extract together. Start with a little and add more, since there is no eggs you can taste it as you mix and decide when it's enough. Like I said before, easy peasy! My kids love to making random flavors of ice cream. It’s a fun experiment with crazy flavors! It’s FUN! 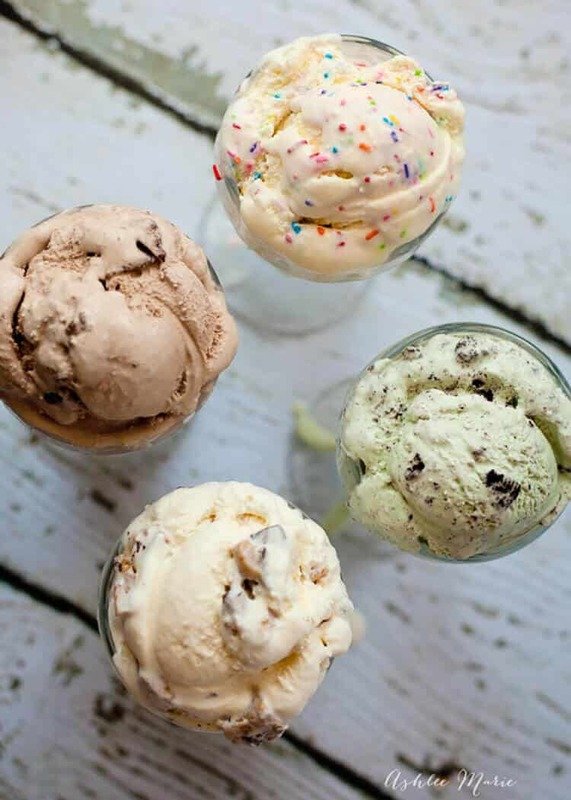 Where do I buy/get the flavorings to make ice cream….I am using fresh peaches, but since our fruits basically have NO flavor anymore…..I would like to add peach flavoring to my home made ice cream…. For my hot fudge ice cream I use actual hot fudge, for strawberry I use strawberry puree… So for peach I’d recommend pureeing the peaches and adding them, depending on how strong you want the peach flavor you might want to cook the peach puree down a little to make the flavor stronger – you only want to add about 1/2 a cup. I’d also add some peach chunks after churning.